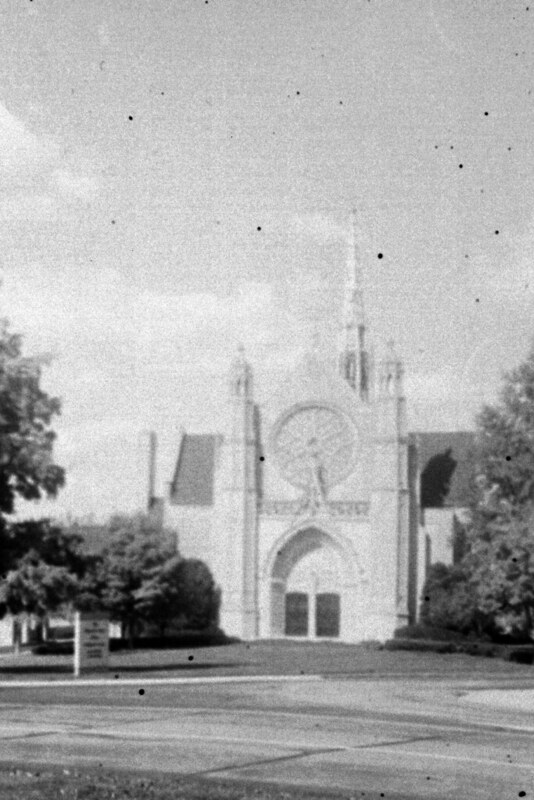 The first time I photographed Second Presbyterian I was shooting my folding Kodak Six-20 and some Plus-X that I bought pre-respooled as 620 from B&H. The entire roll came back looking like this, to my disappointment. I came across the negatives recently and they look normal. My wife bought me a new flatbed film scanner for my birthday, and it takes medium-format film, so I may try scanning the negs myself when I get moved and settled. I’ve reviewed the Kodak Six-20 twice: here and here. That’s a great looking old Kodak; well worth sorting out. I’ll look forward to your impressions of the new scanner. I am faced myself with building a whole new system and may need a scanner as well. I’ll aggressively shed cameras after I move and settle. But I’ll keep this old folder. It will take a while make time for the new scanner, a CanoScan 9000F MkII. It is the last flatbed available that can do both 35mm and 120/620. I’m hoping I can fashion a 127 holder as I’d love to shoot that format a little more. What a cool camera. I too look forward to seeing how you like the scanner. I am in the same boat as Mike. Good luck with that move. It’s an epidemic! Good luck getting back on your feet, computerwise. I kind of like it… reminds me of some grainy UFO photo from the X-Files (albeit an improper subject for that treatment). On the one hand, I envy you getting a film scanner, on the other I really don’t have time for another hobby. Scanning is a chore, no joy in it. If you can afford to have the lab scan your film, do it. It’s not a great camera, but it sure looks good!